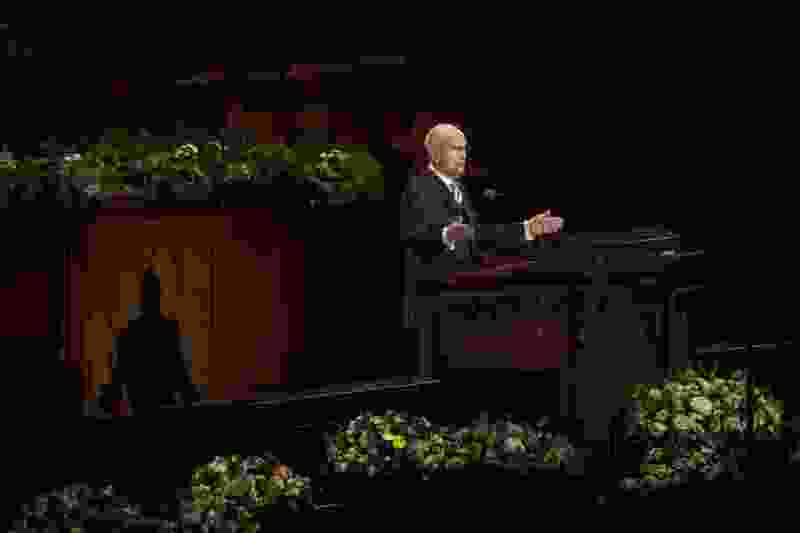 (Jeremy Harmon | The Salt Lake Tribune) President Russell M. Nelson announces the church will no longer have home teachers or visiting teachers during the Sunday afternoon session of General Conference on April 1, 2018. The Church of Jesus Christ of Latter-day Saints really, truly, absolutely wants to be known as The Church of Jesus Christ of Latter-day Saints. Not the LDS Church. Not the Mormon church. It made that clear Thursday — even though the last attempt to eradicate those nicknames for the Utah-based faith flopped. The new push came from God to President Russell M. Nelson, the church said in a news release Thursday. • Use the full name — The Church of Jesus Christ of Latter-day Saints — on first reference. • Refer to “the Church,” the “Church of Jesus Christ” or the “restored Church of Jesus Christ” in shortened or subsequent references. Rocky Anderson, who was Salt Lake City’s mayor from 2000 to 2008, diligently followed the dominant church’s request back then — even using “the Church of Jesus Christ” on second reference, which sometimes earned jeers even from faithful Latter-day Saints. For authorities such as Nelson, the faith’s name is more than branding. “For thus shall my church be called in the last days, even The Church of Jesus Christ of Latter-day Saints,” Smith declared in Doctrine and Covenants 115:4. In a 1990 speech (a year after former church President Ezra Taft Benson sang “I Am a Mormon Boy” from the pulpit), Nelson, then a member of the Quorum of the Twelve Apostles, spoke of the importance of using the church’s full name. LDS blogger Jana Riess, a senior columnist for Religion News Service, also believes the drive may fail. In academia, “Mormonism” is by far the preferred term, said Patrick Mason, head of Mormon studies at Claremont Graduate University in Southern California. In addition to Claremont, there are three other professorships in “Mormon studies” — at the University of Utah, Utah State University and the University of Virginia. Wilfried Decoo, a Latter-day Saint writer and professor in Belgium, understands his faith’s desire to be seen as “Christian” by urging everyone to use its full name. Gordon B. Hinckley, who became church president in 1995, understood the dilemma. Hinckley knew that wasn’t the actual meaning, but adopted the man’s thinking about the tag.